There are a lot of factors that contribute to the recipes I share on this blog. It could be what I am craving for, what my family likes (or demands! ), what I see on social media, etc. That cute pineapple tag from Noteworthy --- Her tags are just the perfect thing to add whimsy to your gifts in the coming holiday season. This Pineapple tag caught my attention (naturally!) and I hurriedly purchased a beautifully ripened pineapple and hacked it away with glee to produce a bottle of this unique jam. Grace Chan's (Honeyydrizzle) Instagram post about Strawberry Chia Jam. --- First of all it was a stunning post! She even used a Good Morning towel as the backdrop! If you are Filipino or have lived in the Philippines for quite some time now, you would instantly find joy in the fact that the Good Morning towel was integrated in such a classy post. It was genius! Also, using chia seeds with stewed fruit will get it to the jam-like consistency faster than boiling it with copious amounts of sugar. A bottle of coco syrup from Coco Natura. --- Using coco syrup as my sweetener already brings so much benefits to the table. The coco syrup is made from 100% coconut sap which is rich in minerals, vitamins and amino acids (esp. potassium, B vitamins). Compared to brown sugar, coconut sugar has 36 times the iron, four times the magnesium, and over 10 times the amount of zinc. It is considered a low GI food, which means it will not cause a spike in blood sugar levels. 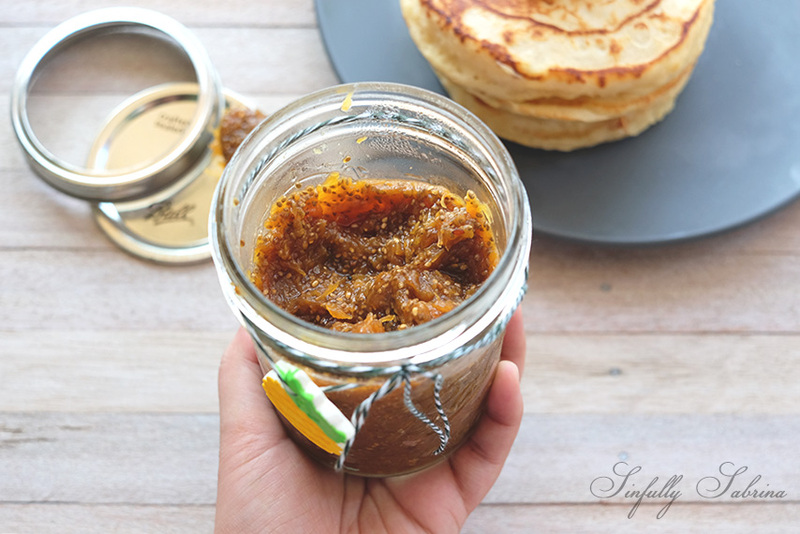 All the ingredients used in this Pineapple Chia Seed Jam recipe are fresh and healthy! I love that it had just the right amount of sweetness. This morning I enjoyed it with my homemade pancakes! It was sooo good and guilt-free! This is also a great homemade gift idea! Set a medium saucepan over medium heat and add the pineapple and coco syrup. Heat fruit, stirring occasionally, until it begins to liquify, 20-30 minutes depending on your fruit. Allow it to come to a boil, and let it continue to boil until it begins to break down and form a saucy consistency, about five minutes. Place mixture in blender and quickly pulse since the pineapple tends to be fibrous. Stir in the chia seeds and let cook for another minute. Stir again, remove from heat, and let sit until thick, about 10 minutes. Shot with a Fuji X-T10.